Dental implants offer a permanent solution to missing teeth and in the modern, up to date world of dentistry should definitely be a treatment option to seriously consider. Dental implants were developed to offer reliable stability for a natural-looking appearance. 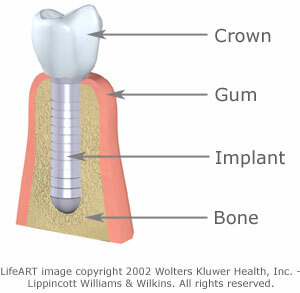 Implants transmit chewing forces to the jaw bones, which help to maintain a healthy and stable bone. Can stabilise conventional dentures so that patients may experience more comfort when talking, smiling and eating. If a missing tooth is replaced with a bridge, the neighboring teeth have to be ground down to carry the bridge. This is not the case with a dental implant. It may thus contribute to the preservation or neighboring teeth. Each case is different and needs to be treated on an individual basis. Dr Olivelle will conduct a thorough examination and assessment as to whether dental implants are a suitable option. He will discuss his findings, together with the appropriate treatment options available in full. Essentially, a dental implant is an artificial tooth root which, after placement into the jaw bone, can support a crown, bridge or denture. A dental implant is screw shaped and made of commercial grade titanium and miraculously, will integrate, (grow/join), with the bone so that an artificial tooth can be fixed on top of the implant to then look and function as a natural tooth. Dental implants are a well-established, tried and tested treatment option and approximately 95% of modern implants last for at least 15 to 20 years. You can have any number of teeth replaced by the use of dental implants – from a single tooth to a complete set. Because implants are permanently anchored into the jaw they are completely stable and secure. They require no special maintenance apart from your usual dental hygiene routine and also, unlike bridges, they are not attached to adjacent teeth and hence do not affect the structure of existing teeth. Dental implants are suitable for most adults, regardless of how the teeth have been lost. There are only a few cases in which they would not be recommended and a full assessment would be carried out to ensure that implants are the right solution for you. In many cases the cost of the treatment is only a little more than the cost of more conventional treatment using crowns and bridges and the advantage of a single tooth implant is that it avoids the need to cut down the teeth either side for crowns to support a bridge. Often, denture wearers cannot eat or speak well due to the lack of stability of the denture but by fixing a bridge to implants this problem is cured. Full denture wearers can suffer from very unstable dentures, particularly if they are long term wearers. A simple solution to this problem is to secure the denture onto 2 or 3 implants allowing the denture to be stable and increasing both comfort and function. As part of the assessment, your oral hygiene and perio, (gum), status will be checked and x-rays will be taken to determine whether there is sufficient healthy bone for the implant to be placed into. If there are signs of gum disease, this will have to be treated first. Likewise, if there is insufficient healthy bone then it may be necessary for a bone augmentation procedure to be carried out before the implant/s is placed. Smoking is a significant risk factor for dental implant therapy and augmentation procedures and reduces the success rate by 11%. The treatment takes approximately 12 months from the initial assessment, to the time when the artificial tooth is permanently fixed to the implant. This can vary depending upon the complexity of the case. If you are interested to know more about dental implants, talk to your Dentist and if it is not a treatment that he/she offers get him/her to refer you, or contact Budleigh Salterton Dental Practice & Implant Centre directly. Our friendly reception will be happy to discuss the matter in principle with you and then arrange a convenient time to conduct an assessment as to your suitability. Please feel free to download our ‘Implant Information Booklet’ for a more detailed guide to Dental Implants. This term is also known as bone regeneration and the aim of this procedure is to optimise the position of the dental implant so that a cosmetically pleasing and functional crown can be placed. Sometimes there is insufficient bone or tissue in the area to place an implant due to the body’s natural process, over a period of time, to remove it when a tooth is lost. The result is a concavity, (deficiency), in that region. Other factors can also influence the loss of bone, such as an abscess or dentures. The procedure involves placing bone forming material, (bone grafting), into the deficiency, which then encourages your own bone to grow. There are several types of bone grafting materials available, including host, (one’s own), from donors, (human), animals and man-made. All ‘out sourced’ materials are scrupulously tested and processed by approved laboratories to ensure that it is harmless. The surgical procedure is performed under local anaesthesia, in a strict and sterile environment and involves having stitches placed. Depending on the quantity of bone regeneration required, this may be carried out at the same time as placing the implant or may involve separate surgical phases. As with any surgery, there may be some swelling and discomfort for a couple of days after the procedure but you will be given appropriate medication to help with this.